When Rep. Bill Cassidy (R-La.) 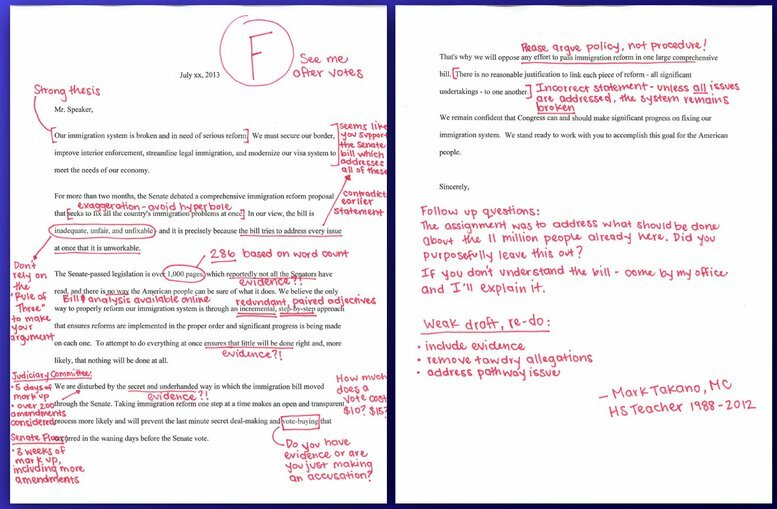 started circulating a letter that complained about the Senate's immigration reform bill, he may have expected some grumbling from Democrats, but he probably did not expect to get a failing grade. Penned back in April, Cassidy's letter was addressed to Speaker John Boehner (R-Ohio) and complained that the Senate bill was "unfair" and that it had been written in secret. Cassidy also called on fellow Congressmen who oppose the immigration reform bill to sign his letter to Boehner. Takano posted a noted-up version of Cassidy's letter on his Tumblr and Facebook pages Thursday and included the following message: “[T]hought I'd offer my edits to the author before they submitted their final version [of the letter to the Speaker] ... Still not signing it.” He also invited Cassidy to come by his office for further explanation. Unsurprisingly, Cassidy’s office does not seem pleased with Takano’s actions. A spokesperson for Cassidy told the National Journal that Takano's "grandstanding represent[s] everything Americans hate about Washington."